Sophisticated cyberattackers are compromising organizations at an unprecedented rate — and with devastating and costly consequences. Last year, threat actors were present on victims’ networks for an average of 101 days before detection. In addition, 77 percent of surveyed organizations said they were compromised in the last 12 months. Security operations teams must work diligently to protect their organizations, but with limited resources and mountains of data, it can be an uphill battle. So what’s the solution? The answer is simple: reduce the amount of time it takes to detect and respond to a cyberthreat. However, many organizations struggle to achieve this goal. The key is to assess your organization’s security operations maturity, benchmark critical security operations key performance indicators (KPIs), and then focus on where to improve so you can advance your security maturity and reduce time to detect and respond. 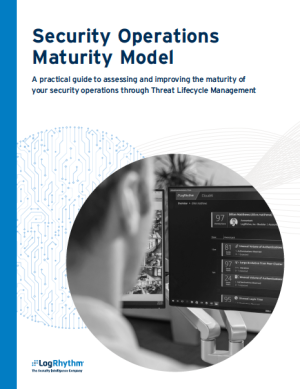 LogRhythm’s Security Operations Maturity Model explores how to assess and evolve the principle programs of your security operations center (SOC): threat monitoring, threat hunting, threat investigation, and incident response. This white paper provides a framework that will help your organization ideally align technology, people, and process to support these programs and evolve overall security operations maturity. Download the Security Operations Maturity Model white paper and learn how your organization scores, how to measure your team’s effectiveness, and how to improve your organization’s overall security posture.